2. Works in all cars, easy to install and remove. 3. 360 degrees free rotating. 4. Over current and over voltage protection. 5. With fashionable goose neck design, can be adjustable to any direction you like. 6. 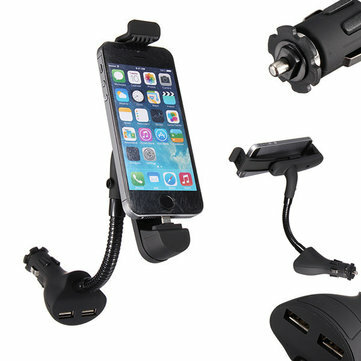 Built-in dual USB car charger, quick speed and high efficiency charging. 7. Non-slip feet, keep your cellphone in holder steadily. Broke my old one by being uncareful. This one is even better with two usb ports. My iPhone is now always charging and I can charge the phones of the kids as well.